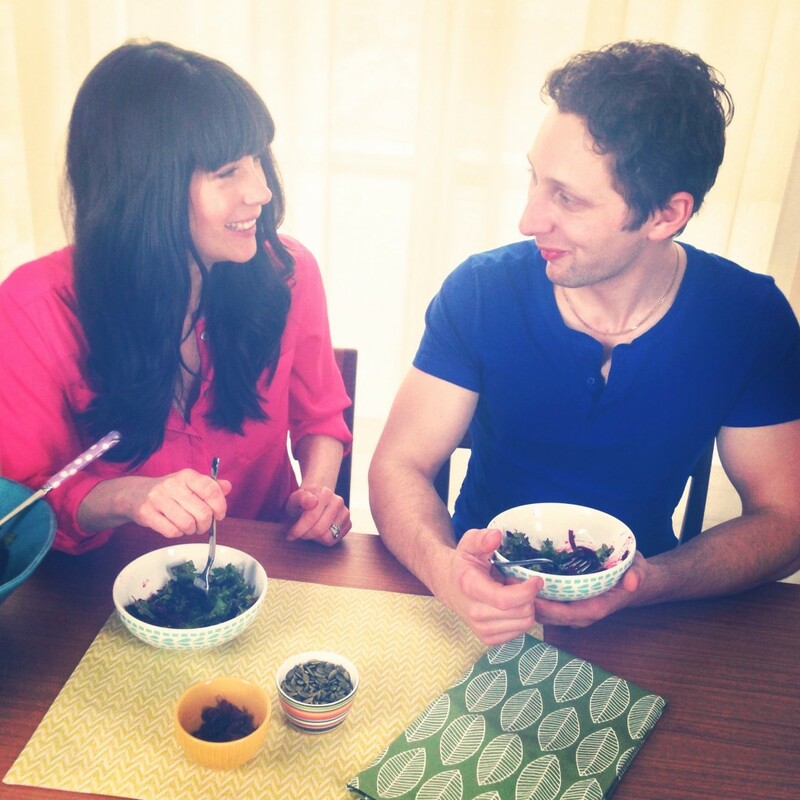 I'm joyous to share my first ever special guest in a recipe video -- my sweet hubs Walker. We love this kale salad and make it regularly. We always make extra so we can have it for an energizing lunch the next day. It's even better on day two because the flavours have a chance to mingle. As a nutritionist, I always love to share the health benefits of my recipes so be sure to check out the nutritional highlights below. Best part of this video is how Walker "strips" the kale, HA! Enjoy! After a long day at work it's a the perfect boost of vitamin C and detoxifying nutrients. I hope you enjoyed the video recipe! I'm the messy one, he usually cleans up after me LOL! Haha, I think you are right! Hi Joy, this recipe looks delish!! Cant wait to try it. Wondering, how do you feel about bottled lemon juice (ie realemon)? Would you recommend avoiding its use or is it acceptable? Hi Natalie! I definitely do not recommend realemon. Despite their misleading name it's nothing like the real thing! Plus it's bottled in plastic which is terrible because the acid in the lemon juice will certainly leach plastic chemicals into the juice. Grew kale in our Calgary garden for the first time last year with great success (yes even in our weather). Can't wait to try this recipe. Love your contagious laugh! This salad looks amazing! Question: are the beets cooked or raw? I'm thinking by the number of people who've asked me this now I should have said this in my video :) oops! Yes, they are most certainly raw! Looks yummy...do you cook the beets first? No you don't have to, they are raw! What type of beets did you use? Did you roast your own and chop, or did you use pickled beets from a jar? I used raw beets and then grated them. Fabulous! Let me know how you and your hubs make out. This is a detox friendly meal for sure! Great on-screen chemistry. You two are hilarious! Hi Joy! I can't wait to try this recipe! Thanks for sharing! I bought your book yesterday and read it back to back in one evening. I'm super inspired and ready to make a big lifestyle change. I've been losing and gaining weight as well as counting calories for a long time now and I hope this new way of eating and living will help me get rid of them for good. Thanks for your support ! Thanks Joy! This was so delish!! It's the first recipe I try with raw beets and will definitely make again (Not sure if I was supposed to peel the outer layer, so I did, then grated the beets). It was a bit messy, but that's what the kitchen is for, right? This salad rocks! Yum, yum -- thank you. I experimented with making it in the food processor: - made the dressing first with the regular blade (used 1/2 the recommended quantity of dressing) - kept the dressing in the food processor, and added the massaged kale and the pitted dates. Pulsed until they were chopped. - carefully switched to the grater blade, leaving everything in the processor. Grated the beets. - Dumped everything into a serving bowl. Done. Took about 1.5 minutes total. The kale was washed ahead of time, then massaged. Sorry for the confusion! I can easily make this vegan by using bee free honee, but any suggestions on how to make this low fat? What could I use instead of oil? Would maple syrup work in place of the oil and honey maybe? in the video it shows you washing the kale after you massage it. is this correct? i have never massaged kale before so i am unsure. but the salad looks delish! I used organic spinach, and baby green instead of the kale. Sliced raw beet using a mandolin, and added cucumber, radish, green onion, tiny organic mushrooms, feta cheese, as well as a half of a tomato that needed using up. Threw on some pumpkin and sunflower seeds and sliced almonds. Topped with some cottage cheese, and the dressing. MM... Made extra for lunch tomorrow!!!! Yum. I made it with golden yellow beets. It was delicious.